I've been a long time lurker reading all your posts/videos/project logs and learning massive amounts so thank you! Now I understand this will still be okay for boring holes, and fly cutting... but facing a flat bottomed hole now out of the question. So what would you do? The seller described the item as: "MST facing & boring head in excellent condition comes in box with boring bars and head tools." Also what about fitting a sleeve and machining a new MT3 taper to make it true? (I have lathe and milling machine available). Jim hello and welcome aboard. The majority of professional boring heads have detachable arbors, as the manufacturer would want to sell them into a variety of machine markets. Some screw on (most) but I've seen ones with a recessed flange - perhaps you can manufacture a new arbor to sort the wobble? I'm not familiar with that particular boring head but I suggest you examine it carefully - the MT3 shank and the main body of the head just might be two separate pieces. Might be screwed, might be press-fit, might be Loctited. If you can access the maker's catalogue and they offer the same boring head with a choice of shanks, I'd suspect that would increase the probability that shank and body are separate. If so, and if you can separate them, a new MT3 shank might cure the problem and I'd think it would be easier than sleeving and re-machining the existing MT3. You could start with a MT3 blank end arbor and machine just the blank end to suit the boring head body. Looks like Andrew and I were typing at the same time! Great minds think alike, ............ Good morning, Andrew. I stripped some of it apart last night before swmbo requested an audience. Unfortunately I couldn't see a join before the body of the head hollows out and has part of the mechanism inside. So I might be out of luck. It was sold with a int-40 sleeve which was over the MT3 shank. All the material I have seen says that this is a Japanese copy of a Wohlhaupter UP3. I will have a closer inspection of the head tonight and let you know. You can often identify if assemblies are in two parts by oiling with a light oil (WD40 will do) - wipe clean then gently warm the part with a hair drier. Hidden joints are revealed by small traces of oil coming out of the join. I had a Wohlhaupter with a MT3 shank and it was integral to the body. You could tell if the shank was integral from the serial number on the body. I think if Mo.3 appears in the number then it's an integral shank. The same might apply to your Mizoguchi. 1) The older UPA-3 heads had integral one piece construction. However, the removable shank has been the standard for many years, and most of the heads in use today are of the two piece design. 2) If you look down through the hole in the back end of the shank, you should see a hex socket. This is the screw used to hold the shank to the head. If there is no access hole or hex socket, you probably have an old one piece unit. If the hex is there and you want to remove/replace the shank, be careful that you turn the hex bolt in a clockwise or R.H. rotation. (Metric wrench of course) The shank is held to the head with a differential screw design. Hi Jim and welcome, are you using the Int 40 sleeve or the MT3 ? 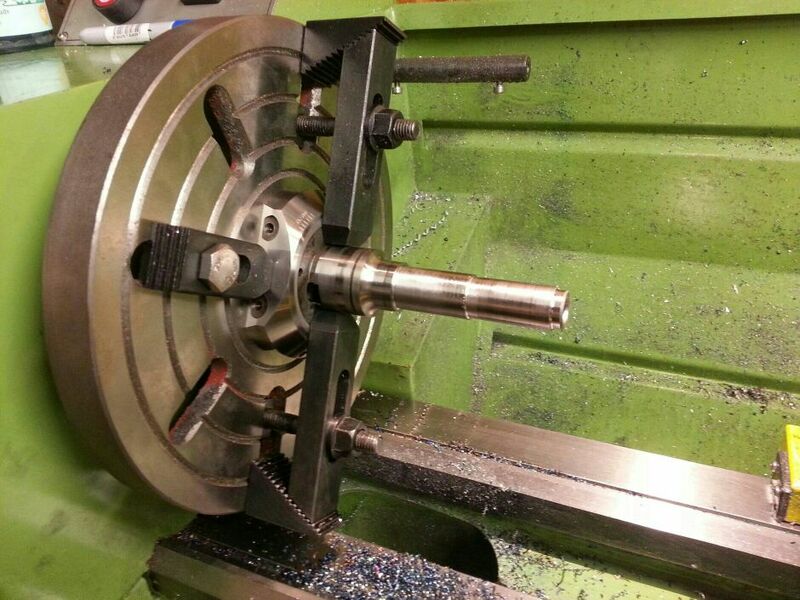 If you're using the int40 sleeve then it may be possible to machine the mt3 shank to fit another sleeve type. I've had a quick look and it is all one piece... I will triple check tomorrow and strip it down completely. So it looks like I can do a couple of things. 3. Try to bend it back somehow? Would it be possible to have someone true up the taper on a cylindrical grinder? Might work if its not badly out of whack. Whip the draw bar out and offer it in to the MT3 before it locks up or holds, any play? Check for any dinks on MT3 and clean before inserting. Could also be your machine taper. Check for any dinks on the body of boring head, mind could have crashed with a boring bar in. If it is bent I would hate to think of the forces needed unless its in two parts. Long time since I posted on this... I have mounted the body up on the faceplate. Dialed it in and have started truing up the shank. I think I will shorten it down to remove the drawbar hole and think about making a new arbour to attack to what is left. Just need to figure out the best way to attack a new arbour.